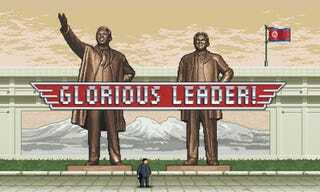 Moneyhorse games today announced Glorious Leader!. It is a game where you play North Korean leader Kim Jong Un. You can ride a unicorn. You fight Americans. It has Dennis Rodman. A side-scroling action game, Rodman isn't just a feature, he's your co-op buddy. Here is the "press release". It is the best. The Democratic People's Republic of Korea commands you to know that the capitalistic pigs at Moneyhorse LLC, are developing Glorious Leader! , an epic tale about the triumph of Kim Jong Un over the entire American army. 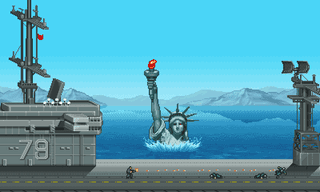 Battle through 7 unique levels as you defeat waves of imperialists, combat over-the-top bosses, and ride unicorns!